Lost in Shots: is there anybody out there? great photo; very mysterious lights! Gosh; that's so creepy to look at! It's a great effect, whatever the cause. Beau-ti-ful ! The lighting is just perfect, you should have kept the secret about the lights in the middle, at least a little longer so that we could have speculated about it. Nice one! die streuung unter wasser schaut fein aus. omg, sie werden uns holen! great shot - shame i didn't wait long enough to get some of those shots too. i think i was starting to get cold. this shot reminds me of the film "The Abyss"
wow! that water looks like liquid gold, and the lights coming from the divers (?!!) are really cool! geniess die letzte zeit und mach noch ein paar schöne fotos! Ich hab's ja gewußt: sie sind unter uns! Der Farbgegensatz ist so dermaßen schrill, daß der Schmerz schon wieder ins Gegenteil umschlägt. Den Hintergrund finde ich eigentlich noch viel spannender als das cyanene Licht. Äußerst spacig. I believe in aliens!!!! :) Really nice photo congratulations! This is so cool. Reminds me of the film The Abyss. I love it! Phantastisch! Die Lichter im Wasser machen das Bild zu etwas ganz Besonderem. Sowas habe ich einfach noch nie gesehen - und etwas besseres als was ganz Neues kann man in einem Fotoblog ja wohl nicht entdecken! Beautiful image, the mystery lighting in the foreground completes the package. Creepy but beautiful, reminds me to "The Abbys". Great shot Marina. this is really a great one! i don´t know anything about the technical aspects of this picture - i am just blown away by the colours, the light, the pure magic. you´ve got the view, you´ve got timing, you´ve got the skills. you are really an artist. this is your masterpiece. 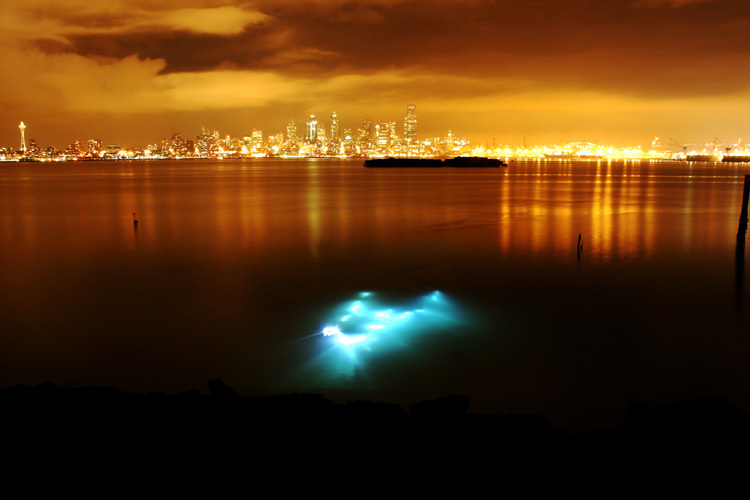 I love it, the city lights, the smooth water, and those lights are just freaky! Lies den Schwarm von Frank Schätzig, dann erfährst Du's! interesting image, something is in the water, nobody knows what it is. Das hätte ich gerne in ziemlich groß an meiner Wand! This is a truely stunning and beautiful shot. You have captured the skyline so well. As for the blue lights in the water - whatever it is it adds a wonderful point of interest to the shot.